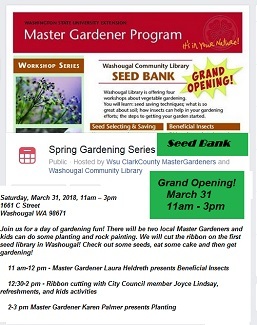 The Washougal branch of the Fort Vancouver Regional Library is having their GRAND OPENING for their SEED BANK library, March 31, 2018, 11am – 3pm, Saturday! Not sure what a Seed Bank is? Well, it is like a library for SEEDS, instead of books. You can “check out” seeds that you take home and plant. You can “check in” extra seeds you have left over from packets you’ve bought, or even ones you’ve harvested from your own garden. The WSU Extension Master Gardeners, in conjunction with the Washougal branch of the Fort Vancouver Regional Library, and many volunteers, have set up the first seed bank in Southwest Washington! The seed library is being stocked right now with lavender, parsley and other heirloom herbs, vegetables and flowers. Area residents can check out several packets of seeds at no charge. Seven raised garden beds are being planted to grow and harvest seeds to go back into the library. The actual seed library is INSIDE the Washougal branch of the Fort Vancouver Regional Library at 1661 “C” St., Washougal, WA 98671. Want to help? Seeds you’d like to grow? Have seeds you’d like to donate? Join us for a day of gardening fun! There will be two local Master Gardeners and kids can do some planting and rock painting. 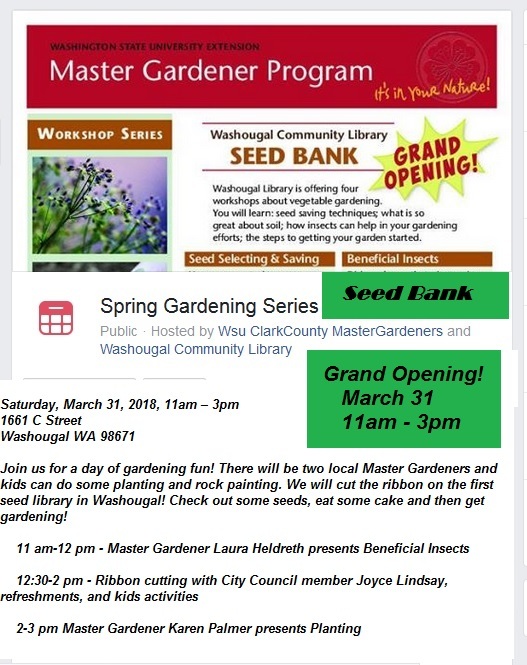 We will cut the ribbon on the first seed library in Washougal! Check out some seeds, eat some cake and then get gardening!